Korean dramas continue to spread throughout the world and achieving the highest success in Japan, China and Southeast Asia. Dramas from Korea are also widely popular in The Philippines and I'm proud to say I am one of the people who got really hooked with these TV shows. This is just going to be a quick post about the Korean dramas I loved and I'll just state one reason or two as to why I liked them. Winter Sonata (a.k.a. 겨울 연가) was broadcasted by KBS in 2002. It is the second part of the Endless Love installment that has 4 parts. It stars Bae Yong Joon and Choi Ji-Woo. The story begins when Yong Joon moves to Chuncheon and meets Ji-Woo. The two will fall in love with each other at an innocent and early age. But unfortunately, Yong Joon will die and Ji-Woo will be left miserable because of his death. Ten years later, the group of friends have a reunion and Ji-Woo's friend introduces his boyfriend who is from the U.S.A. who resembles Yong Joon so much. This was one of the very first Korean dramas that I have watched. I was in high school and I remember watching this at night together with my mother. My mom liked Bae Yong Joon's face, I liked the story. It was very touching and I also liked the song "My Memory" who was performed by Ryu. The story was really heartbreaking and even the ending was sad when Yong Joon was about to loose his eyesight. Full House (aka 풀하우스) is a 16 episode series broadcasted by KBS in 2004. It is a romantic comedy TV series that stars famous singer Rain and Song Hye Gyo. It became a huge hit and was one of the main reasons for the expansion of the Korean Wave. The story revolves around Song Hye Gyo who lives in a house called Full House that was built by her father. One day, her two friends tricked her by sending her on to a vacation and selling her house and taking the money. On the plane, she meets Rain who is a famous actor. When they get back to Korea, they will find out that they will be living in one house. The two won't get along with each other since he has a bad temper and she is a happy-go-lucky type of girl. The two set up a marriage contract of six months but as time goes by they will find out that they have already fallen in love with each other. This story is just so cute! Song Hye Gyo is beautiful and Rain is totally handsome. I like that the story is light and funny. You could just sit back and relax and these two will entertain you. It's not like the other heavy drama TV series that make audience cry rather each scene is funny and you will feel light after watching it. I like it because the two have such a good chemistry and I like how Song Hye Gyo is so pretty but Rain didn't find her attractive at first. I also loved the scene where she sang the "three little bears" song for Rain's grandmother. That was just too hilarious! 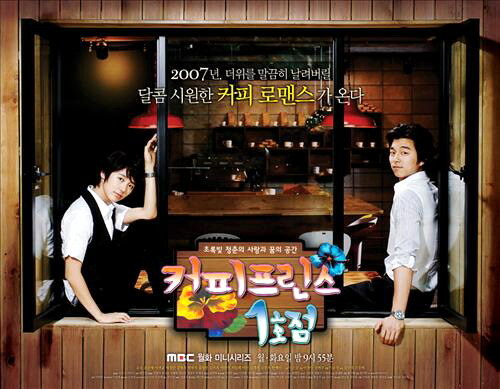 The whole title of this drama is The 1st Shop of Coffee Prince (커피프린스 1호점). It was aired in 2007 and it stars Gong Yoo and Yoon Eun Hye. The drama is a love story between tomboyish woman pretending to be a man as she tries to works at the coffee shop owned by Gong Yoo. This drama was one of the first of its kind in Korea that featured 'homosexual' elements because the man does not know initially about the woman's true gender and thinking he's going crazy for falling for a 'man'. I have watched this drama about 4-5 times already and I can say this is one of the best dramas ever made. Although, people who are not open to homosexual scenes may find it offensive. But, you just need to get the essence of the story to eliminate the chances of being offended. I really like Cinderella stories where the young and poor girl meets the rich but bad tempered boy. The reason why I like it is because it gives women hope that somewhere out there, there's still a man who's willing to look beyond looks and money when it comes to love. Brilliant Legacy / Shining Inheritance (찬란한 유산) was aired by SBS in 2009. The casts were singer Lee Seung Gi and actress Han Hyo Joo, The drama consisted of 28 episodes and got its top spot in viewer ratings for 10 consecutive weeks, the last episode attained a high viewer rating of 47.1%. Hyo Joo was a daughter of a business man and she studied in the U.S.A. Her father remarried to a woman who has another child to her former husband. Hyo Joo has a mentally challenged brother who likes playing the piano. Seung Gi, also studied overseas but was ordered by her grandmother to return to Korea and manage their food business. The two met when their luggage accidentally switched on their plane flight. This is where they would create misunderstandings and hatred towards each other. The day they agreed to return the luggage to the owner, Hyo Joo's father 'died' and that left her nowhere to go to. She worked part time but unfortunately, she lost her brother. She lived miserably in a small room until one day, she saw a grandmother who had an accident. She brought her to the hospital and let her stay in her room for a couple of days. The grandmother turned out to be Seung Gi's grandmother and she asked Hyo Joo to live at her home. Seung Gi and Hyo Joo develop more hatred towards each other but as they work in projects together, they finally discovered good things about the other person and that how their love story began. Just like Coffee Prince, Shining Inheritance is also one of the best I've seen. Now that I'm writing it, it hit me that it had 28 episodes which made me wonder how was I able to watch it for 3 times?! (lol) I like it because the story is just like my favorite Cinderella story theme. Seung Gi is an arrogant heir and Hyo Joo is a poor girl who lost her fortune, father and brother. They hated each other at first but then they fell in love at the end. I also like it because it tackles values about the family and about handling business and people. I like how she changed him from being arrogant to a responsible and understanding man. My Girlfriend is a Gumiho (내 여자친구는 구미호) was broadcasted by SBS in 2010. It stars Lee Sung Gi and Shin Min Ah. Gumiho is a fictional character in South Korea which means nine tailed fox. The story began when Seung Gi, who is a spoiled brat, tried to escaped his furious grandfather and reaches a monk. He saw a painting and a voice instructed him to draw nine tails on the fox. There were lighting and thunder after that so he ran out of shock. He reached a forest and got into an accident. He saw a beautiful woman in white dress who healed him. The next day, the beautiful woman followed her all the way to the city. It was later revealed that he is carrying the most important stone for the woman and that's why she must stick with him to protect her precious. One of the main reasons why I like this is because of Lee Seung Gi. There was a point in my K-Pop addition stage where I got tally in love with Lee Seung Gi. And that's why I came to watch this drama 3 times. It was my first time to watch a drama where Shin Min Ah was starred and I have to day that I also liked her beautiful and angelic face. The scenes in this drama were also hilarious and I love how Mi Ho is crazy about BEEF and Saida (Korean drink). There were also scenes were I cried, but all in all this is a feel good drama that I suggest everyone to go and watch it. Personal Taste (개인의 취향) is a drama series adapted from a 2007 novel by Lee Sae In about a man pretending to be homosexual in order to become roommates with a woman who lives with a woman who wants to live with a gay male friend. It's a romantic comedy drama aired by MBC in 2010. It stars Lee Min Ho and Son Ye Jin. Jeon Jin Ho played by Lee Min Ho is a budding architect to pretends to be gay in order to become roomate with Son Ye Jin. She owns a mysteries 'Han Nok' (traditional Korean House) that has never been opened to outsiders. Kae In (son Ye Jin) is very trusting, which is why people always take advantage of her, so she let's Jin Ho in her house. Jin Ho entered Sang Go Jae (Kae In's house) with a mission of finding the secret about the traditional house which will let him win an architecture contest. I haven't watched B.O.F. yet so I don't know how Min Ho did on that drama. But I could say that he did very well in this drama. His acting was very natural and he looked so handsome (as always). I like that he was a successful and handsome guy who knows how to reject temptations and won't go for women who try to cling on him and seduce him. How rare are those kinds of men and I really want to want a meet like Jeon Jin Ho in person. He was very sweet and responsible. He took care of Kae In when she was sick, he cooked food for her, cleaned her house, did her laundry, cut her fingernails, blew dried her hair, played games with her, kissed her and most especially loved her and made her happy. Secret Garden (시크릿 가든) is a TV drama series broadcasted by SBS from Nov. 2010 to January 2011. It stars Hyun Bin and Ha Ji Won. Secret Garden is special for Hyun Bin since its his first ever drama on SBS. This drama tells the story of Kim Joo Won (Hyun Bin) an arrogant CEO of a shopping mall and Gil La Im (Ha Ji Won) a poor and humble stunt woman. The two accidentally meet as Joo Won mistakes La Im for another actress that his cousin wanted him to look for.After their first meeting, Joo Won was greatly disturbed by La Im's existence and h keeps on thinking about him every day. They went to Jeju Do to shoot a music video for Joo Won's cousin 'Oska', who is a famous singer. The two got lost in the forest and reached a hidden restaurant named Secret Garden. The woman handed them two bottles of fermented wine and when they got back to the hotel, they drank the wine and they just found out the next day that they were switched! Secret Garden is one of my all time favorite Korean dramas. I feel that I would still remember this even when I get old and tell it to my children. Yes, that's how deeply hooked I got with this Korean show. I have watched this for 6 times and I think I would be watching it again anytime soon. (lol) Again, it has the theme that I love the most and that is the Cinderella story. Kim Joo Won is a rich, handsome and a CEO of a big shopping mall. While Gil La Im is a poor and tough stunt woman who lives in a small apartment together with her friend. I love how arrogant Joo Won is but he never wins over La Im's heart. He did everything for her and he even risked being removed as the CEO when he fell for La Im. And that's the end of my article about Korean dramas. Please don't take this post negatively. I mean, I still do watch local TV shows but I think there's nothing wrong with watching foreign ones. I actually think it's good because you get more knowledge about other culture. Have you seen these dramas? If you have other dramas in mind and I missed to mention them, please comment below and let me know!